Darrel Higham's been rather prolific, to say the least! This were his first two albums from 1994/1995 shortly after the demise of Bob and The Bearcats. 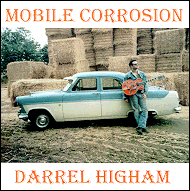 Mobile Corrosion is a bit more 'country' than a lot of his other stuff. Eddie Cochran fans will love 'Rockin' band blues'. The other musicians are Rusti Steel (lap steel), Les Curtis (drums), Mick Wigfall (bass) and Dave Brown (piano). "Born on the 5th January 1970 in Bedford, England, Darrel Higham is widely regarded as one of the most talented and original artists to have emerged from the British rock'n'roll scene in many years. Alongside his collection of Brian Setzer and Shakin' Stevens records, however, sat re-issued recordings by the original greats of Rock'n'Roll like Elvis, Gene and Eddie Cochran. He was greatly impressed, not only with the inimitable vocal prowess of these legends but also with the guitar styling of their now equally legendary lead guitarists; Scotty Moore and Cliff Gallup. Eddie was somewhat outstanding in Darrel Higham's eyes, however, in that not only did he have a unique voice, but played his own tremendous lead guitar. On some of his hits, he even played all the instruments making use of overdubs years before anyone else in Rock'n'Roll! 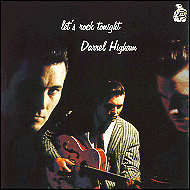 This impressed Darrel more than anything and he soon became a multi instrumentalist himself. He played slap-bass with Rusti Steel and The Tin Tax backing such rockabilly legends as Terry Noland, Merrill E. Moore and the late Johnny Carrol. Switching back to lead guitar, he formed the highly successful Bob and The Bearcats in 1991 with vocalist Bob Butfoy.